Zapier is a web automation app. With Zapier you can build connections (called Zaps) between your favorite apps which can automate parts of your writing workflow. Next, you'll be asked to enter your Airstory username and password. 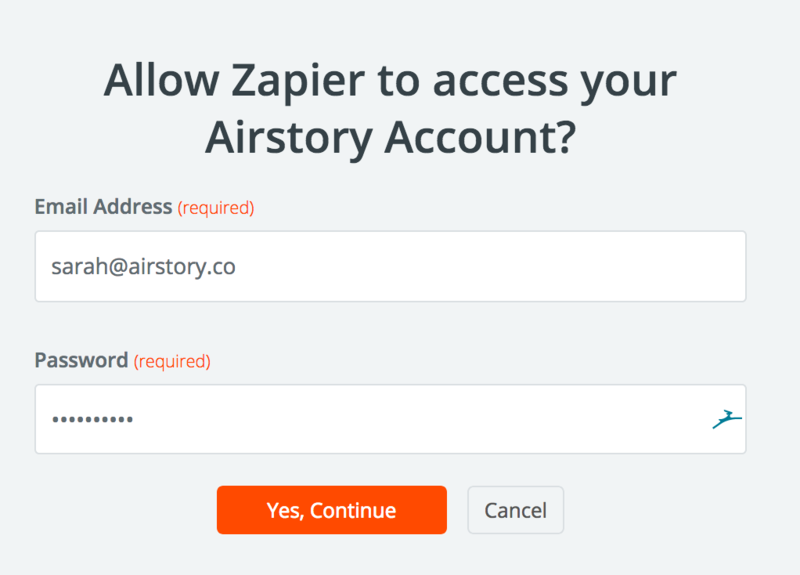 Once connected, your Airstory account will be available in Zapier, and you can easily select it from Zapier's account dropdowns, and begin composing Zaps to assist you in your writing. If you’ve got a Zapier account, you’re going to love how easily Airstory & Zapier work together to automate your project and note creation. Important email from your boss? “Star” it in Gmail, and it instantly becomes an Airstory note. Want to save important messages from your teammates to a shared document? Automatically toss "starred" Slack messages into your shared Airstory project. Feedback from a client on Twitter? "Like" the Tweet and it's immediately saved as an Airstory note in your Airstory 'Voice of Customer' project. Researching sales copy? Send Typeform survey entries to Airstory as notes. See the top Airstory Zaps here! If you'd like to know more about Zapier, have a look here.